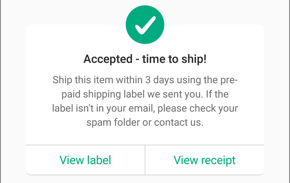 To ship an item to a buyer, you'll need to use the label we send you by email or in the app. In the app, go to your chat about that item, then tap View label to get a PDF of the shipping label. In email, look for email from OfferUp.com. If you don’t see it, check into these potential problems. Check your email's Junk or Spam folder for emails from OfferUp, and move those messages to your Inbox. Add OfferUp to your list of safe senders so you won't have this problem again. You'll need a way to print the label, and a computer that can open the label as a PDF. For free software that will open PDFs, try Adobe Reader. If none of these work, please contact us.